I pledge allegiance to the flag of the United States of America and to the country for which it stands: One nation, under God, indivisible with liberty and justice for all. 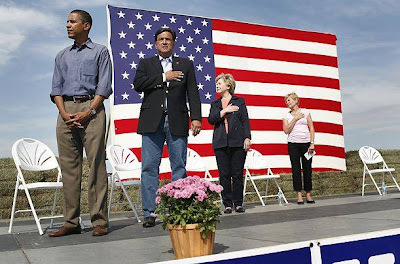 So who does Obama pledge his allegiance to? ** Bold words added as emphasis by me. "[C]ivilizational war is real, even if political leaders and polite punditry must call it by another name." The reality is this: Though the Democrats will not have a nominee until August, unless Hillary Clinton drops out, Mr. Obama is now the front runner, and its time America takes a closer and deeper look at him. Because the truth is that Mr. Obama is the single most liberal senator in the entire U.S. Senate. He is more liberal than Ted Kennedy, Bernie Sanders, or Mrs. Clinton. Never in my life have I seen a presidential front runner whose rhetoric is so far removed from his record. Walter Mondale promised to raise our taxes, and he lost. George McGovern promised military weakness, and he lost. Michael Dukakis promised a liberal domestic agenda, and he lost. I have never before heard such vaporous, two-way, fluff emitted in such a strangled delivery cadence with offbeat "notes" and strange syncopated emphasises - especially one that copies heavily from Dr, King. He may think he's a natural jazzmaster, but it's his white feet tapping a strange rhythm.